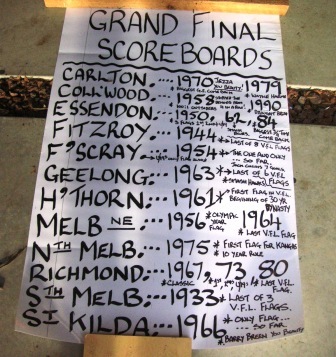 Steve Miller makes Grand Final scoreboards. Not full size. 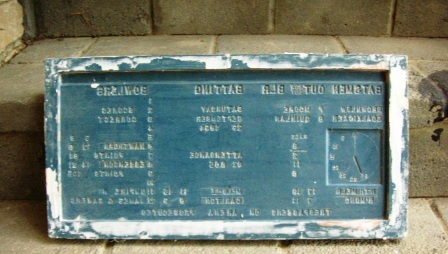 His scoreboards measure 50 centimetres across and 25 centimetres from top to bottom. 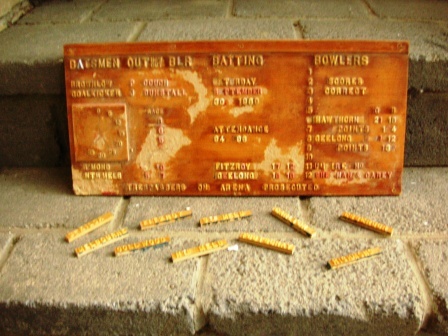 They are replicas of Grand Final details, based on the classic old MCG scoreboard that was moved to Manuka Oval in Canberra in 1982. The details include not just the scores of the main game but those of the reserves and the under 19s, the total minutes of the final quarter, the umpire’s (or umpires’) name, the date, the attendance, the year’s Brownlow Medallist and leading goalkicker, and the results of the last race. 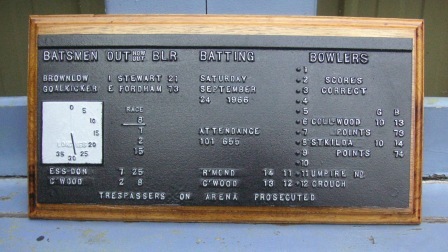 A ‘deluxe’ edition of the 1966 scoreboard: cast aluminium on blackwood. 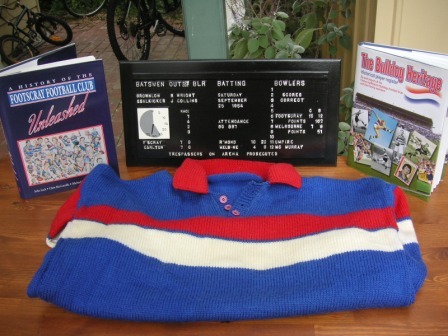 Steve made his first model scoreboard in 1999, as a way of paying for his ever-increasing collection of football memorabilia, especially WEG Grand Final posters. That first scoreboard was of the Saints’ one-point win in 1966. It has sold like hot chips on a freezing day at Moorabbin. Mad-keen Saints fan Molly Meldrum bought a score of the 1966 scoreboards and presented them to each of the premiership players at a reunion few years back. “I saw Molly on the telly one day, holding one of my scoreboards. I was rapt!” said Steve. 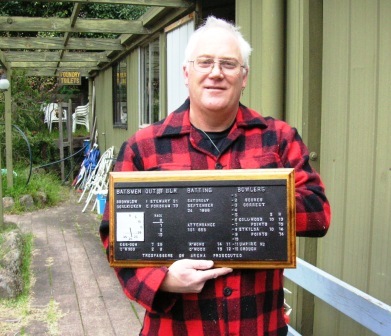 A life-long Bombers fan, Steve has made about 600 scoreboards, featuring over 20 Grand Finals, and the 1977 Centenary Test. His latest batch feature 1993, 1995, 1999, 2002, the 2010 Grand Final and the 2010 Grand Final Replay. In the pipeline are the 2011, 2012 and 2013 Grand Finals. His ingredients and tools include an MDF master pattern, Super Glue, shellac, wax, a fibreglass mould and high-quality gypsum (or patternstone) plaster. It takes him about eight hours to assemble a new board. The master pattern, with details from the 1989 Grand Final. A mould of the 1984 Grand Final, one of Steve’s favourite Grand Finals. An engineering patternmaker by day, Steve happily describes himself as a “footy nut”. One of his earliest footy memories is going to Windy Hill as a boy of nine, and climbing the willow tree next to the scoreboard (possibly the W.G.Brew scoreboard). But what really caught his eye was his first visit to the MCG two years later, in 1971. “Dad and I walked along Pneumonia Alley and up the steps from underneath the Northern Stand. The first thing I saw when we got to the top of the steps was the scoreboard. It was sensational. It was so big. “Back then, when there were six games on a Saturday, the scoreboard told you not just the story of the game in front of you, but the story of the day, with all the scores – quarter by quarter – from the other grounds. You’d look in your Footy Record to match the letters, A and B, C and D, etc and figure out the scores. Steve’s dad Bob took his son to all the Grand Finals from 1972 to 1986. “I don’t know how Dad got tickets, but he did. They were always standing room only. I could hardly see anything at the 1980 Grand Final.” Steve’s last Grand Finals were 2000 and 2001. 1954: a year to remember for Footscray fans. Steve lives on the northern fringes now. The nearest footy ground is at St Andrews. But it has no scoreboard, no clubrooms, and just one set of goalposts. Steve said the local club folded in the 1970s and the pavilion was finally knocked down two years ago. 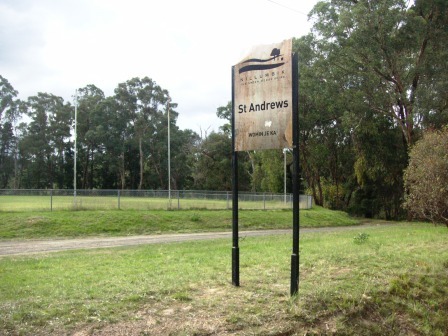 But just up (and down) the hilly roads are clubs at Kinglake, Panton Hill and Hurstbridge, each with different types of scoreboards. 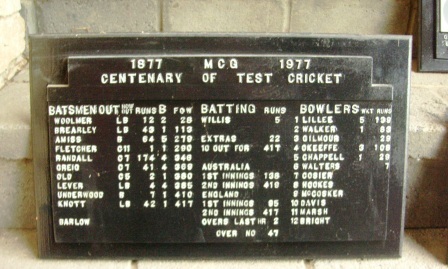 Have you done the scoreboard when Victoria scored 1107 against New South Wales in the Sheffield Shield in December 1926? ‘Am enjoying your comments, Graham.Steve’s phone number is at the bottom of the story if you want to follow up about the cricket scoreboard.